1939 was the year of the third French championship and it was surely more mature and steadier. Despite the advise of some specialists who asked the organizers to give the winner FF 50,000, it was decided to grant the same amount of money as in 1938, that is to say FF 20,000. The point system was the same as well. At first the organizers wanted to grant points to the first three drivers of each race only. It was finally decided to keep the ’38 rules but we will talk about them later. Five sports races, three voiturette races, two Formule Internationale races and one hillclimb. One more time the French champion was to be versatile. The main French teams were, as usual, Bugatti (with Jean-Pierre Wimille as the main and nearly sole driver), Talbot (whose brand-new MD90 was ready and whose drivers were René Carrière, Philippe Etancelin and René Le Bègue) and Lucy O’Reilly-Schell’s team whose drivers were René Dreyfus and “Raph”. Both were ready to drive the now famous Delahaye 145 V12. Among the privateers there was the great Raymond Sommer and his Alfa Romeo 308. There was also a new team, created at the beginning of the year: Ecurie Francia. The founders of this private team were three French drivers, Joseph Paul, Marcel Contet and Eugène Chaboud. Their cars were the Delahaye 135 Spéciale. Now that you know the main pretenders, let’s go to Pau, in the south-west of France, which was the place of the first round of the championship. The first race of the championship was a difficult and prestigious one: the Pau GP. The French drivers had no chance to win the race. Of course, in 1938 Dreyfus and Delahaye had beaten the Mercedes-Benz but it was hopeless to expect a second miracle. There were eleven French drivers among the fifteen starters. First, there were two works Talbots for Carrière and Etancelin. It was the very first race of the MD (Monoplace Décalée) type. Jean Trémoulet was at the wheel of the SEFAC, probably the most disappointing French car in history. It was the last race of this single-seater. The Ecurie Francia entered the three Delahayes of the founders: Paul, Contet and Chaboud. Sommer was in Pau with his own Alfa Romeo 308. It was a way for the Italian manufacturer to have at least one car in this race: il Duce did not allow the Italian teams to take part in this French race. And finally, there were various private entries: three Delahayes 135S (for Biolay, Mazaud and Chotard) and two Bugattis (for Trintignant and Balsa). All these French drivers had to race against three Mercedes-Benz W154 (Caracciola, von Brauchitsch and Lang) and one Maserati (de Graffenried). The poleman was von Brauchitsch (1’46’’). The fastest Frenchie was Etancelin (5th, 1’50’’) ahead of Carrière (6th, 1’51’’). Both Talbots and Sommer’s Alfa were the only ones who could hope a good result. At the start, Caracciola took the lead ahead of von Brauchitsch, Lang, Carrière, Sommer and Etancelin. After five laps, Trintignant and de Graffenried were out. Chaboud retired five laps later. On lap 19, Sommer took the fourth position from Carrière. Three laps later, it was Marcel Balsa's turn to retire. No more Bugs on the track. At mid-race the German cars had lapped the other competitors but the race was not over. On lap 82 both von Brauchitsch and Sommer had to stop for refuelling. Both drivers lost one place. Unfortunately for the leader, the team realized too late that von Brauchitsch had enough fuel to finish the race and that his pit stop had not been necessary… Thus Lang won the race, followed by Manfred “unlucky” von Brauchitsch, Etancelin, Sommer, Paul and Mazaud. Consequently 'Phi-Phi' Etancelin was the first leader of the ’39 French drivers championship. Robert Mazaud, who finished sixth in the same lap as Joseph Paul, got off worst: he lost two points when comparing his position with fifth, which he occupied during a part of the race. Eleven days after Pau, the second round of the championship took place near Nice as it was the 43rd La Turbie hillclimb. This race was also a stage of the Paris-Nice rally which was about to be won by Eugène Chaboud ahead of Joseph Paul, both at the wheel of their Delahaye 135S. Among the French entrants only four drivers had been in Pau: Sommer, Paul, Chaboud and Contet. A good opportunity for them to improve their position in the championship and, why not, become the new points leader. Sommer set a time of 3’41” with his Alfa Romeo 308. Le Bègue, who started right after him, set an identical time. Two co-leaders for La Turbie! But now it was time for Wimille to go. The Bugatti driver's start was difficult. Perhaps it was at this very moment that he lost the event as he was only 4’’ slower than Stuck. Once again the German driver, the king of the mountain, was the winner of a hillclimb. Moreover, he had beaten the La Turbie record. Three other La Turbie records were beaten: the ladies record was now in Germaine Rouault’s hands whereas Gordini and Plantivaux were the new record holders in their respective categories. Now, Sommer was the new leader of the championship. But it was only the second round of the championship and Wimille was not far away. One can notice that Joseph Paul (Riley), Marcel Contet (Aston Martin) and Raymond Sommer (Simca) were the only ones who had taken part in the first two races of the championship. At least for the latter it proved his wish to score any point to be champion. Indeed, initially he had to race with a 750cc MG but this car was not ready. As he wanted to score points, he decided to start with his own private 6CV Simca, at least to race a few laps for a 1-point participation. There were five categories: Sports 1.5-litre, Sports 1.1-litre, Race 1.1-litre, Sports 0.75-litre and three-wheel cycle-car. The start was given on Saturday at 4:30pm. Paul (Riley) took the lead from Horvilleur (Riley), Molinari (Simca) and Camerano (Simca). On lap 6, Sommer decided to stop because his own private car was not made for such a race… or any other race. In the same lap Corouge, in his own three-wheel cycle-car had to stop but he succeeded to be back… a few hours later. Eleven cars were now on the track. Paul was the fastest and nobody could follow his path. Horvilleur had some trouble as soon as the second hour and he retired three hours later while he was too far to hope any good result. Bonnet (DB), Camerano (Simca) and Contet (Aston Martin) continued to be among the first four or five drivers. During the ninth hour, Paul had to stop and nurse an old injury to his arm. Bonnet collided with another racer but could go on whereas Camerano had some technical trouble. Consequently, Contet and De Burnay took the opportunity to move up the field and reduce the gap to the leader. Thus, at 2:00am, Contet took over the lead from Paul. The latter was too tired and decided to retire. There were two other retirements: Breillet (Simca) and Corouge (Corouge). Contet, De Burnay and Debille were the only ones to increase their average speed during the second quarter of the race. Despite the night and tiredness the second quarter of the race was faster than the first one: the first leader (Paul) completed 112 laps during the first six hours while the second leader (Contet) completed 123 laps from 10:30pm to 4:30am. Contet continued to be fastest on the track. He completed 82 laps from 4:30am to 8:30am whereas Debille drove 76 laps and De Burnay 47 laps. It was at this moment that De Burnay lost the race. He was in the same lap as the leader at mid-race and lost 35 laps in the next four hours. Of course, when I say that Contet was the fastest it also meant that he made less pit stops or quick ones and that he did not lose too much time on the track. Consequently Contet increased the gap and Bonnet was now second ahead of De Burnay and Debille. It was a beautiful race for the latter as he was 9th after six hours, 6th after twelve hours and 3rd after eighteen hours. It is true that he also took profit from some retirements. It was the case when De Burnay retired during the eighteenth hour, as well as Tronquet and Camerano. Contet's path had been steady. This had not been the case with Bonnet who had some trouble between the twentieth and the twenty-second hour, and he lost one place to Debille. Molinari had some difficulties too: he suffered from sunstroke! He had to stop but finally decided to go on and finish the race. He lost about twenty laps and perhaps lost an opportunity to take fourth place from Guérin. At the end of the race Bonnet had some trouble and lost any hope of the podium. At last, Contet won the race after a fight of 24 hours. The 1939 Bol d’Or was not the most exciting but victory in such a race was always impressive and each winner could be proud of that. Nevertheless, there is some doubt about the final classification. Indeed, in L’Auto dated June 5, 1939 it was written that Bonnet completed 977.75km, which equalled 3rd in the 1.5-litre Sports category. This means that Bonnet was only 7th in the final classification and that he could only have scored one point in the championship. This was confirmed by the championship classification which was published in the same newspaper. But there is a problem: Bonnet had completed 1635km after 18 hours. So he could not have driven just 977.75km after 24 hours… Moreover it is said that he was 3rd in his category, in which it was necessary to make 1320km to be classified. This was not the case if he had made only about 1000km. So? So it is possible that there was a printing mistake in the newspaper or in the publication of the results. It is probable that Bonnet completed 1977.75km after 24 hours. This means that he finished 4th overall but still 3rd in the 1.5-litre Sports category. This seems to be confirmed by some data I found about the ’39 race, even if these data are sometimes different one from another… However, René Bonnet – co-founder of the DB cars – despite his beautiful Bol d’Or race was not a real pretender for the French championship. Third race, third leader of the championship. After Etancelin and Sommer it was now Contet's turn to be championship leader, having already won the Monte Carlo rally at the beginning of the year. A bit of a surprise and it seemed 1939 was turning out to be a really good year for Marcel Contet! It was nearly summer but at Péronne there was typical Picard weather: rain. This was one of the reasons why there were some DNAs such as Trintignant, Guérin and De Burnay. De Graffenried did not start but lent his Maserati 6CM to Raymond Sommer. The latter was the only one, along with Joseph Paul, who had taken part in the three previous rounds of the championship. The other French starters were Trémoulet (who was in Pau), Horvilleur (who was in the Bol d’Or), Roumani, Decaroli and Delorme. Marcel Contet, the winner of the Bol d’Or and the leader of the championship was not on the entry list. It meant that Raymond Sommer had to at least finish 5th to take the lead back. For Paul it was more difficult: he had to win, which was nearly impossible because of his old Amilcar and because of the high quality level of the entrants. Wakefield and Hug were the logical favourites. There were only ten starters so it was decided to organize only one qualifying heat (instead of two) and a final. The qualifying heat was a 10-lap race. It was an easy success for Wakefield (Maserati) who won, 24” ahead of Hug (Maserati). The others were very far away, at least two laps behind the winner. The best French driver was Trémoulet (Salmson) ahead of Paul (Amilcar). There were two retirements: Delorme (Bugatti) who left the track in the very first lap and Sommer (Maserati) who retired on lap 3. Fortunately, Sommer could take part in the final, which was not the case with Delorme. The final was a 15-lap race with seven starters. Delorme was out and it seems that Decaroli was in the same situation. The case of Joseph Paul is a bit confusing as it seems that he was disqualified because of a push start at the start of the qualifying heat. Others say he shared his car with Grignard. Nevertheless, I did not read anything about that in L’Auto, the main source of this work. Wakefield, the man of the day, was in the lead as soon as the first lap of the final. Hug was second at 18’’ and Sommer third at 21’’. So three Maseratis were in front. On lap 4 Hug retired because of engine trouble, handing second to Sommer. Wakefield was too strong and won two laps ahead of Sommer. Horvilleur, Roumani and Trémoulet finished in the same lap as Sommer. After a big fight the 4th and the 5th place drivers were very close on the finish line. It was a good result for Sommer who took back the lead of the championship from Contet who was a non-starter in Picardy. Horvilleur, who was a good third in this race, was now third in the championship, with Wimille, Paul and Debille. One more time it is a bit confusing reading the classification in L’Auto: it is said that Horvilleur had 7 points after the Grand Prix de Picardie. As if he had scored one point in Pau (he was not a starter there) or in La Turbie (it seems that he was not in the entry list). So, if we consider this was a mistake (was it?) he had only six points. It was surely the peak of the season, the most important race of the year for the French aficionados. This year was a bit special because Wimille was back at Le Mans. He won his very first 24-hour race at La Sarthe in 1937. He did not take part in the 1938 race because Ettore Bugatti did not want to enter one of his cars. Fortunately, Jean Bugatti persuaded his father to enter one car for 1939. The co-driver of the Bugatti T57C was Pierre Veyron, the king of the Voiturettes at the beginning of the 30s. “Technically, nobody can beat Bugatti!” said Robert Benoist, winner of Le Mans in ’37, to the journalists. The other cars able to win were the two British V12 Lagondas, designed by W.O.Bentley himself. The drivers were, of course, from Great Britain: Dobson, Brackenbury, Lord Selsdon and Waleran. There were also the two Delages of Walter Watney with three French drivers (Gérard, Monneret and Loyer) and a Swiss one (Hug). There was also the Alfa Romeo of Raymond Sommer and Prince Bira, and various Talbots. Nevertheless René Carrière was not at Le Mans. In fact, he had an accident during practice for the Eifelrennen. Consequently he had a broken leg and was terribly shocked. He decided to stop his career because he did not want to risk his life anymore. Thus, René Le Bègue was now the second official driver of the Talbot team instead of being its number 3. Marcel Contet was also there, in a Delahaye 135S, with Robert Brunet as a co-driver. So there were various French drivers who could win and score ten points for the championship. For Bugatti it became really difficult: during practice the engine broke. The only way to repair it was to go to Molsheim and take a new set of pistons back to Le Mans. Nobody else but Robert Benoist could do it. He took his own Bugatti 57 and drove it to Molsheim in a racing driver way! Once back to Le Mans, Robert Aumaître, the famous Bugatti mechanic, could repair the engine. It happened on Friday night. Thanks to the talent of Robert Aumaître, the car was ready on Saturday and able to take part in the race. As soon as the start was given, Chinetti (Talbot) led the other drivers. Dobson (Lagonda) was behind him and ahead of Mazaud (Delahaye), Wimille (Bugatti), Levegh (Talbot) and Gérard (Delage). These five drivers fought each other. Chinetti was in the lead until lap 8 when Gérard overtook him and became the new leader ahead of Wimille. The fight went on but Gérard was faster than the others and, after one hour and a half, he was leading Paul (Delahaye), Mazaud (Delahaye), Wimille (Bugatti) and Chinetti (Talbot). Mazaud accelerated and made the fastest lap on lap 25 in 5’12’’1. He was then 10’’ from Gérard. In the meantime Sommer and Bira suffered mechanical trouble and made too much pit stops to hope for a win. The leader of the championship surely knew he could only score one point in this race. The fight between Delage (Gérard/Monneret) and Delahaye (Mazaud/Mongin) was fierce. Chinetti/Mathieson (Talbot) succeeded in reducing the gap with the leaders. So, at midnight, the Delage was 30’’ ahead of the Delahaye and one lap ahead of the Talbot. The Bugatti was fourth. About two hours later, the Delahaye of Mazaud and Mongin caught fire and retired. Fortunately the driver was not injured. At 4:00am, that is to say at mid-race, Gérard/Monneret (Delage) was still leading ahead of Chinetti/Mathieson (Talbot), Wimille/Veyron (Bugatti) and Hug/Loyer (Delage). The four cars were in the same lap! Four hours later, the race had changed: the Talbot and the second Delage were not in the race any more. Both had retired after about 2,000km because of an accident… The Delage of Gérard and Monneret were now three laps ahead of the Bugatti of Wimille and Veyron. There were still eight hours to go. Unfortunately for Walter Watney’s team, the 3-litre Delage had some exhaust manifold trouble and had to stop several times. Gérard and Monneret did not retire but they lost too much ground. They were overtaken by the Bugatti and in the end lost out by three laps. They lost no less than six laps in the last quarter of the race. It was Wimille's second Le Mans victory. The average of the winner team was 139.782 kph. Two victories out of two participations: 100% success. It was also a great success for Amédée Gordini and José Scaron: thanks to their 10th position they won the Biannual Cup, the Index of Performance as well as the 1.1-litre Class. But it was worth one only point for the championship. Finally, it is interesting to note that this race was the fastest pre-war 24 Heures as Wimille and Veyron completed the longest distance while Mazaud turned in the fastest pre-war lap. With this victory, Wimille was back in the fight for the championship. He was now second, only one point from Sommer. It seemed as if the two best Fench drivers were facing each other, ready for the battle. Wimille had taken part in two out of five races and scored 16 points (avg. 8pts/race) while Sommer had taken part in every race with an average of 3.4 points. It was clear that Sommer had the talent but in 1939 he did not have the cars for a win. Contet, who retired at Le Mans, scored one point and was still close on the heels of the two French stars. Two races in one weekend. This is quite usual today as in many present championships there are two races at each meeting. Of course this was not the case in 1939. Nevertheless, on this July 9, there were two races for the French championship: the voiturette Coupe de la Commission Sportive and the Formule Internationale Grand Prix de l’ACF. The first race of the day was the voiturette race. The specialists were there: the ERA boys (Dobson, Bira, Pollock and Hanson) as well as the Maserati boys (Wakefield, Dipper, Hug). Unfortunately the Alfa team failed to appear. Dobson and Bira, the fastest drivers during the practice session could not take part in the race. Dobson’s ERA E had engine trouble and Bira crashed during practice. Consequently, Johnny Wakefield, the third fastest driver, was on pole. There were five French drivers. Sommer (Maserati) and Contet (Simca) were on the fifth and third row of the starting grid respectively. It meant that both men, well placed in the French championship, had a good opportunity to score the necessary points to increase the gap (for Sommer) or to reduce it or even try to take the lead of the championship (for Contet). Among the three other Frenchies, Joseph Paul (Simca) was the only driver – with Sommer – to have taken part in each of the six races of the championship. The two others were Roger Loyer (Maserati) – who retired at Le Mans at the wheel of a Delage – and Amédée Gordini (Simca) – who was 14th at La Turbie and 10th at Le Mans and won the 1.1-litre category in both races. The three Simcas of Contet, Paul and Gordini were entered by the Gordini team. However they were unable to fight for victory. The only French drivers who had a good car were Sommer and Loyer. Twelve starters. Wakefield, Hug and Pollock were on the first row. Hug and Wakefield were the first to cross the line of the first lap and were followed by Pollock. On the next lap Wakefield overtook the Swiss driver while Dipper took the third place from Pollock. It did not last for the latter two as Hanson was third on lap 3 while Pollock retired somewhat later. Sommer ran into trouble and stopped in the pits while Wakefield stopped for 47’’ and lost the lead. Hug was now about 1’20’’ ahead of his British rival while Hanson retired from third on lap 14. When Hug and Wakefield stopped for refuelling, the former's mechanics were quicker than Wakefield's: 1’15’’ vs 1’58’’ because Wakefield’s car did not restart properly. This was how Armand Hug won by nearly 2’00’’ ahead of Wakefield. As we will see later it was Armand Hug's final victory. The winner was very lucky: he ran out of fuel right after crossing the line! Dipper was third, two laps behind both men. The best Frenchie was Gordini in 4th. As usual the French drivers were not competitive in a voiturette race. It is true that the Simca 508C were underpowered Sports cars as the first Simca driver was 6 laps (!) behind Hug. Contet and Paul were 5th and 6th respectively, seven laps from the winner. L.Joa (D), Maserati 4CM, lap ? Surprinsingly, Marcel Contet was still in the fight for the championship, thanks to his 5th place in the Coupe de la Commission Sportive and Sommer's retirement. The ACF Grand Prix, the so-called oldest Grand Prix in history, was the second peak of the French season, along with the 24 Heures du Mans. It was also the second round of the AIACR European championship whose leader was Lang, thanks to his victory in Belgium. For some drivers, such as René Le Bègue, it was the very first Formule Internationale Grand Prix. This young driver was going to race in his country, a very special and important moment. He was at the wheel of the Talbot MD90 he drove in Montlhéry at the beginning of May, when he finished 3rd behind Wimille and Sommer in the Coupe de Paris. The two other Talbot drivers were Philippe Etancelin, at the wheel of the other MD90, and the British driver Raymond Mays who was at the wheel of the MC90. The competition the blue cars were facing were the German monsters. 1939 was the year of Mercedes-Benz and Hermann Lang. This driver was helped by Rudolf Caracciola and Manfred von Brauchitsch. The three of them were in Pau, the first round of the championship. At Auto Union, the other German team, the drivers were Tazio Nuvolari, Hans Stuck, Georg Meier and Hermann Müller. On the Italian side there were three Alfa Romeos 308. They were not able to fight against the German cars, unless a miracle would happen… The Alfas were driven by an Italian driver, Luigi Chinetti, and two French ones: Yves Matra and Raymond Sommer. And finally, there were two other French blue cars at the side of the three Talbots: the two Delahayes 145 of Lucy O’Reilly-Schell’s team. The two drivers were Dreyfus and « Raph ». For Dreyfus, the 1938 French champion, it was the first race of the ’39 championship. 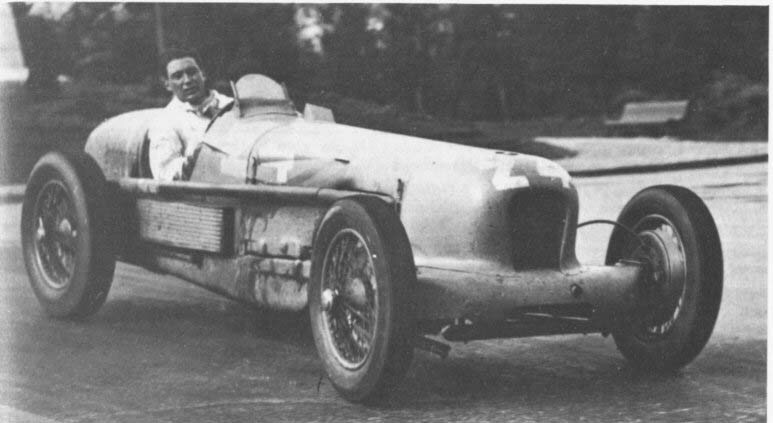 As soon as the first practice session, Nuvolari was fastest (2’29’’9). 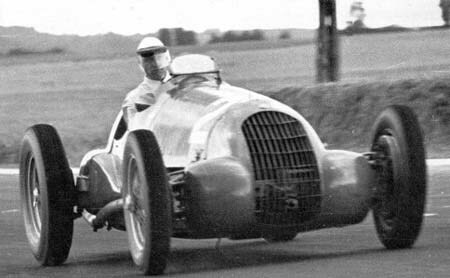 The Talbots were really slow, compared to the Silver Arrows: Le Bègue was 8th (2’48’’0) and Etancelin was 9th (2’52’’2). For the second practice session, most of the drivers improved their time. Thus Lang became the poleman (2’27’’7). On the first row he was alongside Caracciola (2’29’’6) and Nuvolari, who did not improve. The first non-German car was René Le Bègue’s Talbot. He was still 8th despite an improvement of his time (2’46’’3). The difference between the German cars and the rest of the world was incredible, as usual: no less than 15’’6. Today, it would be as if there were 7’’ to 8’’ between the poleman and fourth row of the grid. René was on the third row, alongside Meier and Stuck. As often in Reims, the start of the race was given by « Toto » Roche. Nuvolari was the first at the first corner, followed by Caracciola, Lang and von Brauchitsch. Nevertheless, Caracciola went off the track as soon as this corner and retired. The first two French drivers were Etancelin (7th) and Le Bègue (8th). « Nivola » and Lang were fighting for the lead but this battle stopped on the eighth lap when Nuvolari retired because of a broken gearbox. Etancelin was sixth and Le Bègue seventh. Lang was now 36’’ ahead of Müller. He was the fastest on the track and, on lap 10, the gap had increased to 45’’. In the meantime Le Bègue took sixth place from Etancelin and became fifth on lap 16 when von Brauchitsch retired (broken engine). Behind, it was tough as the MC90 retired as early as on the tenth lap whereas the Delahayes and the Alfas were very far behind. « Raph » was one lap behind the leader as soon as on lap 5! He ended the race seven laps behind the winner. Around lap 20 the German cars stopped for refuelling. Georg Meier’s Auto Union caught fire and the driver received burns to his arm but, once the fire was extinguished, he decided to go on. He was applauded by the crowd. On lap 25 the Talbots were three laps behind Lang. Let’s recall that their maximum speed was 55 kph slower than Mercedes’ one. Lang continued to increase the gap. Neubauer, his team manager, gave him orders to slow down as he drove the only Mercedes still on track. Unfortunately it was too late: the engine broke on lap 36. Thus, three Auto Unions were leading (Müller ahead of Stuck and Meier). René Le Bègue was now fourth ahead of Etancelin. Not too bad. Moreover, the French cars did not need to stop which was not the case of the Silver Arrows which had planned two pit stops. Nevertheless, in spite of that, the Auto Unions were too strong. Their only weakness was perhaps their reliability. Stuck was the last victim of this weakness. He had to slow down, ten laps before the end of the race. Thus, the two Talbots took third and fourth places from Stuck on lap 45. Le Bègue was now third! The final classification did not change. Moreover, some rain on the track enforced the drivers to slow down in order to avoid any accident. Le Bègue and Etancelin were applauded by the spectators and women threw flowers on the track! Just after the race Talbot mechanics realized that Etancelin had only been able to use four gears instead of five. It underlined the good work of Philippe Etancelin. Sommer too had a good result as he succeeded to take fifth place from Stuck at the very end of the race. Thus he scored three points and increased the gap with Wimille and Contet from two to five points. The French honour was safe, at least in appearance. Thanks to his podium René Le Bègue was now fourth in the championship and the best Talbot driver in the classification. Whereas, thanks to its fifth place, the life had become easier for Raymond Sommer. One week after the Coupe de la Commission Sportive the stars of the voiturettes were in Albi. As usual Sommer and Contet were in the entry list as both drivers wanted to score as many points as possible. The three other Frenchies were Horvilleur, Loyer and Delorme. During practice Armand Hug had an accident and was injured to the head. It was really serious and he became partly paralyzed. The talented Swiss driver had to end his career there and then. There were two 20-lap heats. The first one started at 2:30pm. Dobson was leading at the end of the first lap and was followed by Wakefield (Maserati), Tongue (Maserati), Bira (ERA) and Mays (ERA). Not even a single French driver in the first five, not even Sommer. It was not an exciting race. The two main events of this heat were the retirements of Mays on lap 5 and Dobson on lap 9 when he went off the track. The first French driver was only 7th (Sommer), with one lap between 5th place and 7th. For the leader of the championship it was difficult hoping to score “big” points to increase the gap with the second-place man in the championship, Marcel Contet. The start of the second heat was given at 4:40pm, one hour after the end of the first heat. Wakefield was leading ahead of Tongue, Bira, Abecassis, Dipper, Brooke, Contet – who made a really good start – Sommer and de Graffenried. Horvilleur went to the pits as early as in the beginning of the race. After five laps the classification was the same but the gaps were bigger: Tongue was 18’’ behind Wakefield and Bira was 34’’ behind Tongue. There was a big fight for 4th place between Abecassis, Dipper and Brooke. But, while Contet retired because of his brakes, Dipper could not match the pace of Abecassis and Brooke who went on with their fight. But on lap 10 they crashed together. Thanks to these three retirements Sommer was now 5th. It meant three points. Moreover, his main rival in the championship was not in the race anymore, a really good thing for Sommer. On lap 15 Wakefield was still leading but he was now 1’07’’ ahead of Tongue. On lap 16 he had to stop to refuel and lost about 53’’. Tongue did not miss the opportunity to drive faster in order to try and be closer to his rival. Nevertheless Wakefield could be cool because if Tongue wanted to win he had to beat his rival by more than 1’30’’. Nearly impossible. Two laps before the end of the second heat, Tongue was 11’’ behind Wakefield but in the last two laps, Wakefield was the stronger and won by 20’’. Contet, the surprise of the championship, was still fighting for the title and had now even gone ahead of Jean-Pierre Wimille, the French star. There were only three races to go before the end of the championship. Mathematically each driver could still be champion but this was of course purely theoretical. The Comminges GP was back on the racing calendar. The last race was organised in 1936. For 1939, the crème de la crème of the French drivers appeared. A kind of last show before the beginning of the war, which was nearing. Everybody was in Saint-Gaudens to try and win at this wonderful track. Talbot sent two MD90s bodied as sports cars, as this was required by the rules of the Comminges GP. The drivers were René Le Bègue and Raymond Sommer. Delage entered two cars for Monneret and Gérard. Lucy Schell entered Dreyfus and Raph. There were three Ecurie Francia’s Delahaye 135S for Paul, Chaboud and Mazaud. Bugatti sent their star driver Jean-Pierre Wimille. Marcel Contet was there with his Delahaye 135S, making a total of 24 drivers on the entry list. Unfortunately they were only 23 on the grid as Dreyfus’ Delahaye 145 was out on the morning of the race. Consequently, the ’38 champion became a DNS. “It is really simple,“ said Le Bègue. “As I knew it was the last lap I went very fast and that’s all!“ Easy… Second was Sommer, 9’’ behind Le Bègue and the third was Monneret, 22’’ from the fastest driver of the day. On Saturday, Le Bègue was a bit slower (4’16’’) but his time of 4’12’’ was not bettered, although Sommer was not that far off (4’15’’). The third man was Louis Gérard (4’26’’) whereas Wimille did not take part in the practice sessions. He considered that the race was long and that he perfectly knew the track. On Sunday the weather was beautiful. René Le Bègue was of course on the first row with Sommer and Gérard. Raph and Monneret were on the second row. Wimille was last on the grid. The start was given at 2:45pm by Charles Faroux. Le Bègue took the lead, ahead of Sommer and Levegh who made a beautiful start from the third row. Nevertheless, at the end of the first lap, Sommer was the leader followed by Le Bègue and… Wimille. The latter had overtaken twenty cars in one lap! It was the first big performance of this race. Wimille was the fastest and was now close to both Talbots. On lap 5 he took second place from Le Bègue and then first place from Sommer. Everybody thought Wimille was going to fly away. But Sommer did not want to surrender and took back the lead on lap 7. Three laps later Wimille was back in the lead and set fastest lap (4’12’’). At this moment, René Le Bègue had dropped back 20’’ from the leaders, and even Raph overtook him. Gérard and Levegh were trying to do the same. An the front, the fight went on: on lap 12 Sommer set fastest lap with 4’09’’ and was the new leader! Three laps later, Wimille was first again, ahead of Sommer. Raph retired at this moment. It was the seventh retirement in fifteen laps. Thanks to this retirement Le Bègue was now back into third. On lap 19, Sommer improved his best lap time (4’07’’) and, once again, returned to the head of the race. Two laps later it was Wimille's turn. Together they were now 30’’ ahead of Le Bègue and Gérard. On lap 23, guess what? It was now Sommer's turn to be ahead of Wimille. What a fight! Two laps later, there was the first turn of events: Wimille stopped to refuel and repair the radiator of his Bugatti. The stop lasted 55’’. When he returned to the track, Wimille was third, 1’07’’ from Sommer. A few laps later, the second turn of events as Sommer stopped to refuel and change the plugs of his Talbot. At this very moment he lost the race. He returned in third position but too far away. The new leader was 25-year-old René Le Bègue. However, Wimille was still fastest and tried to reduce the gap to Le Bègue. Thus, ten laps from the finish, he retook the lead from Le Bègue, 1’’ ahead of second place and 27’’ ahead of Sommer while improving fastest lap to 4’04’’. At this time, everybody thought the race was over and that a young driver such as René Le Bègue was unable to beat Wimille. Well, not true! René and Wimille were still fighting and it was as crazy as the Wimille-Sommer battle of the first twenty-five laps. Both drivers kept on overtaking each other as Wimille improved his best lap to 4’03’’. Thus came the very last lap. The fight was on. Le Bègue, who was leading, was at 100% and set fastest lap in 4’02’’6 to win the race! There was only 0’’4 between the winner and Wimille on the finish line. Le Bègue had won the Comminges Grand Prix. There were now just two races to go, with eight drivers still mathematically in the hunt: Sommer, Wimille, Le Bègue, Contet, Veyron, Gérard, Etancelin and Paul. That is, it would be true if Sommer would not be a starter in the last two races. However, as we will see, he was sure to take part at La Baule and we can bet he was ready to take part in the 12 Heures de Paris at Montlhéry, which means he was nearly sure to score at least two points in two races, resulting in a minimum total of 31 points. So only those who had at least 11 points after Comminges were still mathematically able to become champion. So the four fighting it out were Sommer, Wimille, Le Bègue and Contet. The tenth round of the championship was planned for September 3. Unfortunately, as we all know, this date was the beginning of World War II, and of course the race was cancelled. Some of the data above are doubtful (see “?”) but they give you a good idea of the Grand Prix de La Baule. This race is also linked to a tragedy. Bugatti wanted to enter a T57G for Wimille. On August 11, Jean Bugatti, son and heir of Ettore, decided to try the car a few weeks before the race. While he was at 200kph on a road in Duppigheim, near Molsheim, he avoided a cyclist and hit a tree. He died instantly. He was only 27. Unfortunately, the French racing people had to suffer another loss. About two months after the death of Jean Bugatti, Laury Schell died in a road accident near Senlis. This driver, husband of Lucy O’Reilly-Schell, was one of the souls of the Ecurie Bleue, the semi-works Delahaye team who helped René Dreyfus win the ’38 championship. Two important people of the racing world had disappeared. If they had survived, racing in France and in Europe could have been different after the war. However, because of the war, the French championship ended early August. The very last race was surely to be the most beautiful with a fight between the two best French drivers and one of their probable successors. On September 21, the organisers decided that the championship was over and that Raymond Sommer was the 1939 Champion. This was confirmed and ratified on December 8, by the FNCAF Council. Do you remember that at the beginning of this article the organisers of the French championship wanted to grant points to the first three drivers of each race and one point for each starter? In this case the final result of the ’39 championship would not have been the same: Jean-Pierre Wimille would have been champion (22 points) ahead of Le Bègue (21 points), Sommer (19 points) and Contet (15 points). But this decision had not been taken and regularity paid off for Sommer. Like many of his fellow drivers, Sommer was enrolled in the army at the beginning of the war. However he went on leave in early February 1940 and travelled to the Automobile Club de France, Place Concorde in Paris, to receive his gold medal. If we look at the results of the first five drivers of this championship we see that Sommer was the only one who did not win a race in 1939. His best classification was a second place in Picardy. But he wanted to be the Champion de France. It was his goal and it is probable that he was the driver who wanted most to be the ’39 French Champion. He was the only one who took part in every race and did his best, often with uncompetitive cars. He was a talented driver and won this challenge. Thus, he won two out of three pre-war French championships, against drivers such as Dreyfus and Wimille. He was simply one of the greatest.